Whisking Through Life: Happy Valentine's Day...Guest Post #2...Strawberry Pop Tarts! So, after graduating he did the poli sci thing and worked on multiple campaigns across North Carolina. Then I moved to DC and 4 months later Thomas became my roommate and I's house guest for a few weeks till he found a job and place to live in the city. Thomas is a great friend and an amazing chef, and whenever we get together food is definitely a topic of conversation. We share a passion for food and a love of cookbooks. I am so glad he agreed to do this post because his pop tarts are delicious and perfect for this Valentine's Day post! 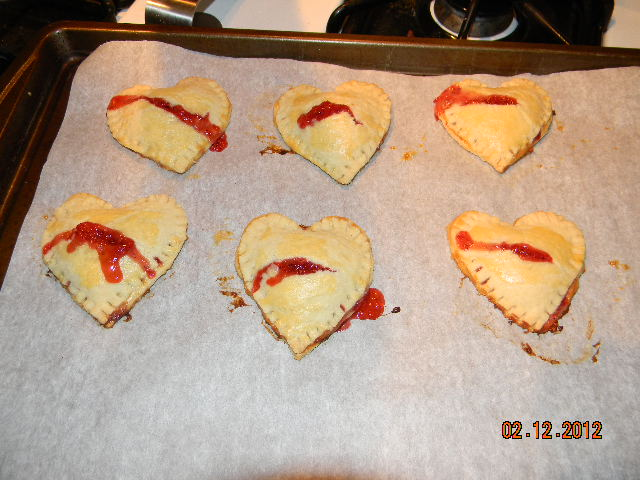 They come out light and flaky with just the right amount of filling. 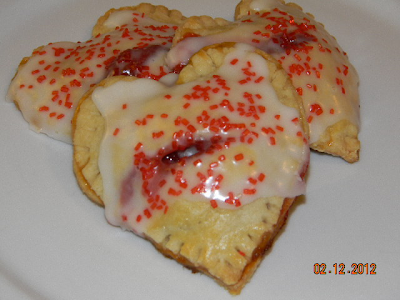 They remind of being a kid and waking up before school and throwing a Pop Tart in the toaster or grabbing a pack before running out the front door because you are running late to catch the bus. But trust me these are better! Way better! Enjoy! 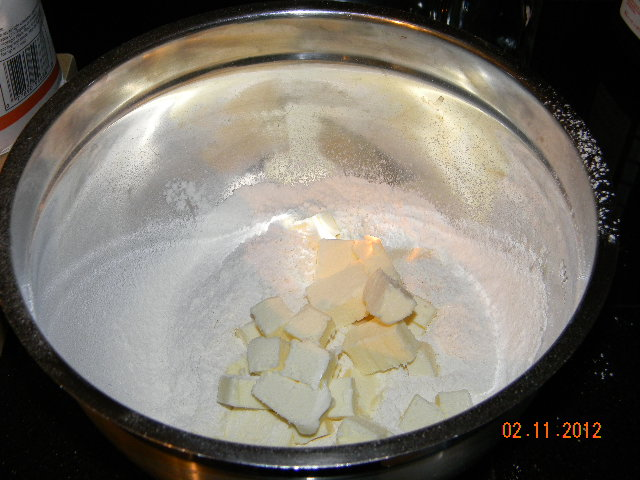 Add butter to dry ingredients. This is what the dough should look like after mixing with your hands. 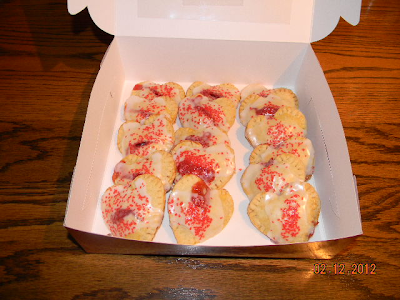 There should be small flakes of butter throughout the dough. I divide it in half and put it in the fridge if I am not using it right away. Sometimes I’ll put some parchment paper underneath so it doesn’t stick as much on the counter and I don’t have to use as much flour. Finished product can now be delivered to the office. *Do a day ahead so filling can thicken in the refrigerator. 1. In a medium-size saucepan, on medium heat, add the strawberries, lemon zest, sugar and salt. Stir occasionally and let thicken about an hour. Add the tapioca and cook on low for 15 minutes. Cool completely and refrigerate overnight. 2. One hour before making pastry dough: Cube butter and place back into the refrigerator. 3. 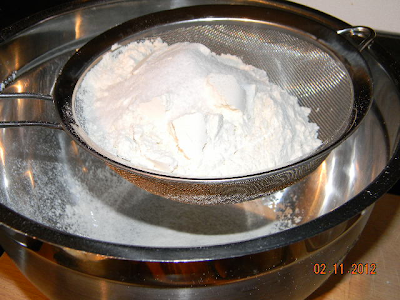 To make the dough by hand: In a large bowl sift together the flour, sugar, and salt. 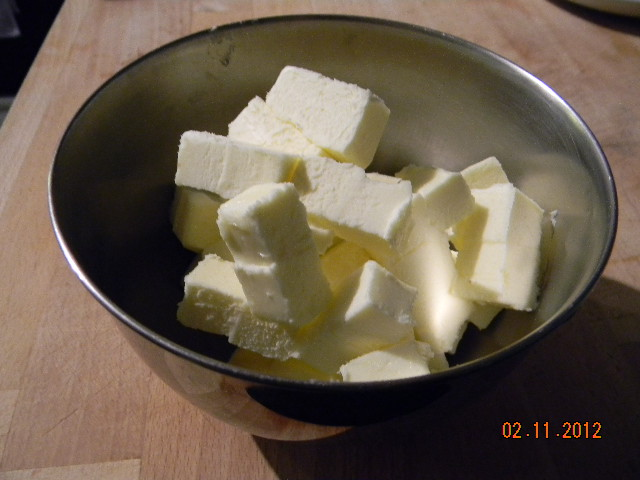 Cut in the butter using a pastry blender until pea-size clumps form. In a separate, small bowl whisk together the egg and milk. Add the egg mixture to the flour mixture and combine using your hands until the dough starts to come together; pea-size clumps of butter should be visible in the dough. 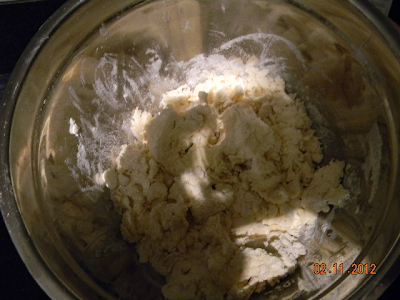 The dough might seem like it is a bit dry, but continue to work it together with your hands before adding more liquid. Add cold water one teaspoon at a time until the dough comes together. 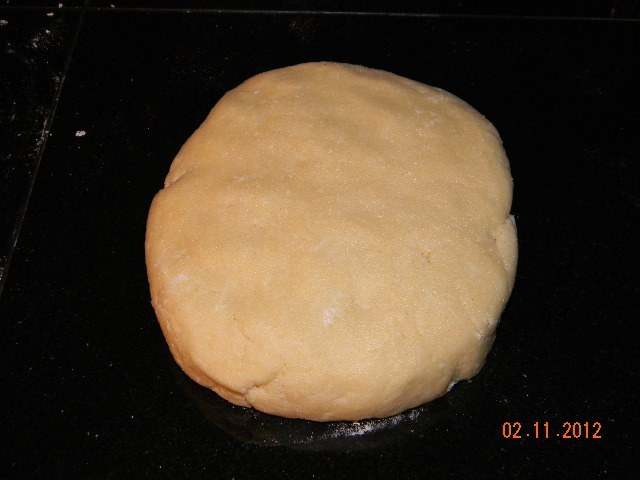 The dough should be smooth with no trace of dry flour and it should not be sticky (if the dough is sticky add a little flour at a time to get the right consistency). 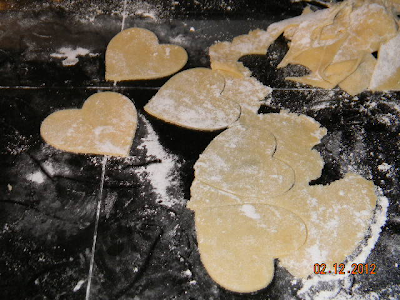 Form the dough into a disk and cut it in half, if you are not going to use it immediately, wrap the disks with plastic wrap and refrigerate for up to two days. 4. If the dough has been in the refrigerator, remove it and allow it to soften for 15-30 minutes. Flour the work surface and roll out dough into a rectangle until it is 1/8 of an inch thick. 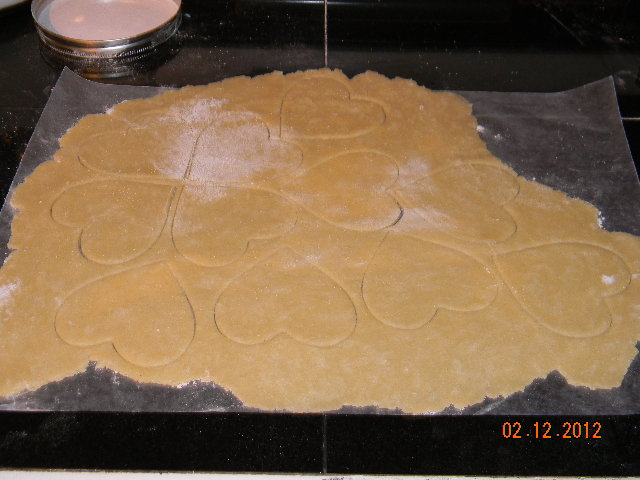 Cut the dough in to heart-shaped pieces using a cookie cutter. 5. 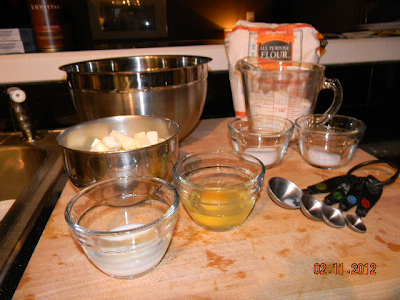 Pre-heat the oven to 350 degrees F. In a small bowl whisk together an egg and two tablespoons of milk; this will be an egg-wash that will act as a glue to stick the top and bottom pieces of dough together. Using a pastry brush, apply the egg-wash to the edge of the top and bottom heart pieces (in batches of 12). 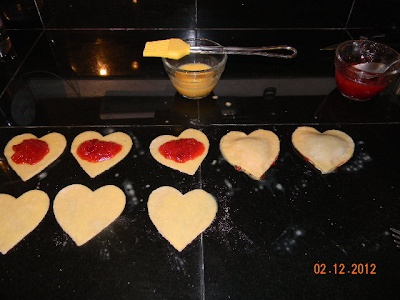 Then add two tablespoons of the strawberry filling on one of the heart pieces and place an egg-washed heart on top (egg washed side should be facing down). Make sure the pocket is sealed by pressing down on sides of the dough using your fingers and then again with a fork (this also adds a nice design around the edge). 6. Line a pan with parchment paper, add 6 of the assembled treats to the pan, and spread an egg wash over top of each. Bake 20-25 minutes until lightly golden brown. Cool on a wire rack for 5 minutes. 7. Mix well the powered sugar, milk, and vanilla extract. Spoon a tablespoon of glaze on top and add sprinkles. Let glaze dry for 10 minutes. Enjoy! Ohh sounds delicious! Am already thinking up some adaptations for different flavours and perhaps some whole wheat switching? 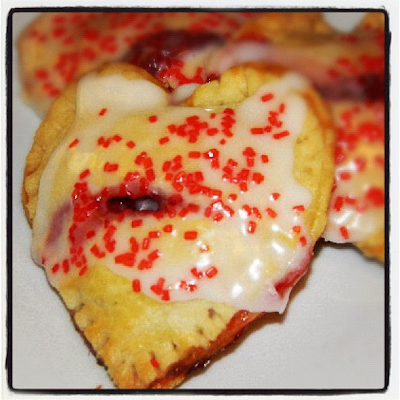 Pop tarts, you had me at hello!